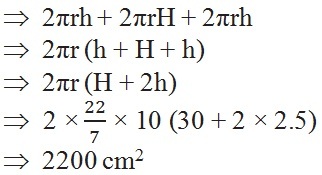 Assume that π = ​ , unless stated otherwise. Q1. The curved surface area of a right circular cylinder of height 14 cm is 88 cm2. Find the diameter of the base of the cylinder. Q2. 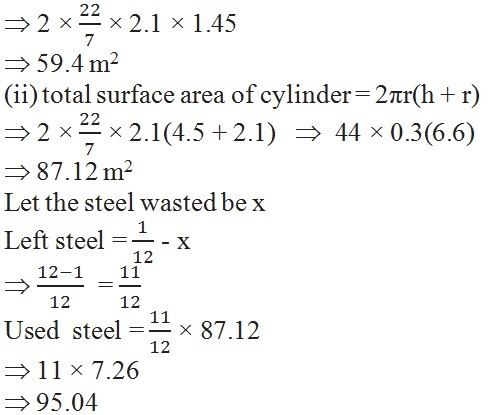 It is required to make a closed cylindrical tank of height 1 m and base diameter 140 cm from a metal sheet. How many square metres of the sheet are required for the same? Hence, 7.48m2 metal sheet required to make closed cylindrical tank. Q4. The diameter of a roller is 84 cm and its length is 120 cm. It takes 500 complete revolutions to move once over to level a playground. Find the area of the playground in m2. Q5. A cylindrical pillar is 50 cm in diameter and 3.5 m in height. 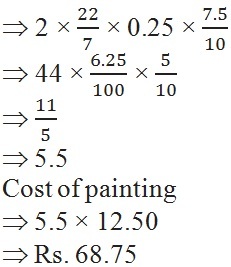 Find the cost of painting the curved surface of the pillar at the rate of 12.50 per m2. Q6. Curved surface area of a right circular cylinder is 4.4 m2. If the radius of the base of the cylinder is 0.7 m, find its height. (ii) the cost of plastering this curved surface at the rate of 40 per m2. Q8. In a hot water heating system, there is a cylindrical pipe of length 28 m and diameter 5 cm. 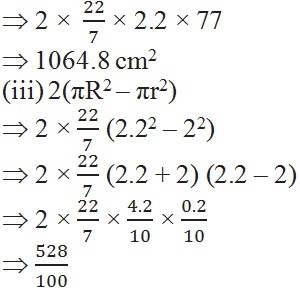 Find the total radiating surface in the system. Q10. In Fig. 13.12, you see the frame of a lampshade. It is to be covered with a decorative cloth. The frame has a base diameter of 20 cm and height of 30 cm. A margin of 2.5 cm is to be given for folding it over the top and bottom of the frame. Find how much cloth is required for covering the lampshade. Q11. The students of a Vidyalaya were asked to participate in a competition for making and decorating penholders in the shape of a cylinder with a base, using cardboard. Each penholder was to be of radius 3 cm and height 10.5 cm. The Vidyalaya was to supply the competitors with cardboard. If there were 35 competitors, how much cardboard was required to be bought for the competition?